Every year, on the third Saturday in September, people join together at sites all over California to take part in the State’s largest volunteer event, California Coastal Cleanup Day. In 2015, more than 68,000 volunteers removed nearly 1,143,000 pounds of trash and recyclables from California’s beaches, lakes, and waterways. Families, friends, coworkers, scout troops, school groups, service clubs, and individuals come together to celebrate and share their appreciation of California’s fabulous coast and waterways. The event is part of the International Coastal Cleanup, organized by the Ocean Conservancy, which is the largest volunteer event on the planet! Students have a way to participate in Coastal Cleanup Day even if they can not get out to a beach or local waterway. Schools can organize a Schoolyard Cleanup on the Friday prior to the weekend event and join in the efforts to protect our coast and ocean, no matter where their schools are located! Rooftop Alternaive PreK-8 School is located at the geographic center of San Francisco. On Friday, September 16, 2016, the students at Rooftop’s Burnett Campus participated in a Schoolyard Cleanup. The students worked in teams to collect data about the trash that they found on the playground and documented their findings with digital cameras and video. Ms. Woo and Ms. Kennedy’s fourth graders collectively gathered 5.05.011 lbs. of trash from the schoolyard. Next, the students will assess the challenges and propose their own solutions for how they might help their school site to stay clean. Just like water, trash can move through a watershed, down streets, through storm drains, creeks and rivers, and eventually out to a lake or the ocean. Preventing and removing litter in school yards and neighborhoods is stopping marine debris before it happens is a very important action that students can take to protect our coast and ocean and the creatures that depend on a healthy ecosystem to survive. “The Dot more than anything celebrates the power of creative teaching,” Reynolds explains. “Despite the test-centric world we live in, creative teachers know how to find those aha moments — much the same way that my 7th grade math teacher Mr. Matson ‘connected the dots’ between math and art, which changed my life.” To honor that moment, Reynolds dedicated The Dot to Mr. Matson. Rooftop School is joining the The Dot Club fun & inviting you to read-along, draw-along, and even sing-along! To get things started, Rooftop librarian Tamra Marshall will be reading THE DOT with all K-2 classes. Be sure to sign your work and share your dot art on International #DotDay – Thursday, September 15, 2016! Let’s fill “Dot Central” – aka the Burnett MPR – with some fresh art! Then, help us to take care of the most important dot of all — “The Pale Blue” Dot! In celebration of Coastal Cleanup Day 2016, Rooftop School will hold a Schoolyard Cleanup on Friday, September 16. Pale Blue Dot from ORDER Productions on Vimeo. The trash gathered at school will be weighed and our information will be entered into the official International Coastal Cleanup Day database. WHAT IS COASTAL CLEANUP DAY? Every year, on the third Saturday in September, people join together at sites all over California to take part in the State’s largest volunteer event, California Coastal Cleanup Day. In 2015, more than 68,000 volunteers removed nearly 1,143,000 pounds of trash and recyclables from California’s beaches, lakes, and waterways. Families, friends, coworkers, scout troops, school groups, service clubs, and individuals come together to celebrate and share their appreciation of California’s fabulous coast and waterways. The event is part of the International Coastal Cleanup, organized by the Ocean Conservancy, which is the largest volunteer event on the planet! Location: Presidio Middle School located at 450 30th Avenue, between Geary & Clement in the Outer Richmond. Cost: Free! But registration is encouraged to help us gauge attendance. For your efforts, you will be entered into a drawing for fun prizes! The drawing will take place on Saturday evening. Prizes distributed at the registration table! 2:00pm-2:20pm Live Sand Painting Demonstration (20 mins.) Students from Kruzhok Studio will create animation films live before your eyes by drawing with beach sand. The terms yin and yang originated in ancient Chinese philosophy. Yin and yang mean literally the “dark side” and the “sunny side” of a hill. In Chinese and much other Eastern thought, they represent the opposites of which the world is thought to be composed: dark and light, female and male, Earth and heaven, death and birth, matter and spirit. Yin yang drawings created by Ms. Hamilburg’s 5th graders at Rooftop School. Sally Ride EarthKAM is a NASA educational outreach program that enables students, teachers, and the public to learn about Earth from the unique perspective of space. The project was initiated by Dr. Sally Ride, America’s first woman in space. The EarthKAM camera was first operated on the International Space Station (ISS) on Expedition 1 in 2001. Sally Ride died in 2012, and in 2013, NASA renamed the program Sally Ride EarthKAM. The Sally Ride EarthKAM camera remains a permanent payload on the ISS, supporting about four missions annually. EarthKAM’s Mission 50 took place between November 10-13, and students around the world were able to request images of specific locations on Earth. NASA has a familiar adage: Follow The Water, for where there is water, there is life. For Mission 50, Rooftop School’s fourth graders made a list of the places where they would like to see water. From November 30 to December 11, 2015 COP21, also known as the 2015 Paris Climate Conference, will brings the world together with hopes of achieving a legally binding and universal agreement on climate, with the aim of keeping global warming below 2°C. The Association of Space Explorers reached out to their fellow astronauts to pass on a simple message of solidarity, hope and collaboration to combat climate change and reach our political leaders during such a crucial time. Play and partnership can help us to imagine and create more peaceful world. On Monday, September 21, the students and teachers at Rooftop School will gather for a moment of peace at Morning Circle. 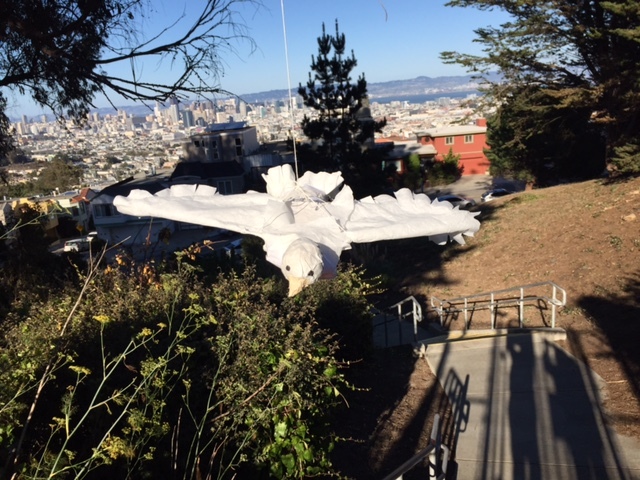 We will fly the peace dove puppets made by third and fourth graders to mark the day with Roots and Shoots, Jane Goodall’s youth-focused organization. When Dr. Jane Goodall was just over one year old, her father gave her a toy chimpanzee named Jubilee, in honor of a baby chimpanzee born at the London Zoo. Friends warn her parents that such a gift will cause nightmares for a child. However, Jane loves the toy carries it with her everywhere. Today, Jane travels with a stuffed monkey named Mr. H, who has been touched by over 2.5 million people from around the world and visited more than 60 countries with Jane. Understanding the power of children in the conservation movement, Jane Goodall spoke directly to youth in this 2008 video interview. As a United Nations Messenger of Peace, Dr. Jane makes it a priority each and every year to observe and celebrate the annual International Day of Peace on September 21. One of the ways that students can celebrate the day is by building a Peace Dove Puppet. Instructions for small and giant puppets can be found on the Roots and Shoots website. Dr. Goodall encourages individuals around the globe to participate in the United Nations International Day of Peace which is celebrated on September 21 each year. 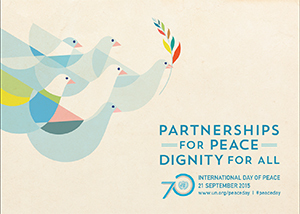 This year, an especially auspicious one with the UN’s celebration its 70th anniversary, will have the theme of, “Partnerships for Peace – Dignity for All.” Click here to learn more about Dr. Goodall’s role as a UN Messenger of Peace and how you can participate in celebrating in the annual Day of Peace. Rooftop’s fourth grade Susty Girls celebrated by creating art from their own hands, while listening to Malala’s Nobel address. Dear brothers and sisters, the so-called world of adults may understand it, but we children don’t. Why is it that countries which we call “strong” are so powerful in creating wars but so weak in bringing peace? Why is it that giving guns is so easy but giving books is so hard? Why is it that making tanks is so easy, but building schools is so difficult? As we are living in the modern age, the 21st century and we all believe that nothing is impossible. We can reach the moon and maybe soon will land on Mars. Then, in this, the 21st century, we must be determined that our dream of quality education for all will also come true. So let us bring equality, justice and peace for all. Not just the politicians and the world leaders, we all need to contribute. Me. You. It is our duty. So we must work … and not wait. Click here for video and transcript of the Nobel Lecture by Malala Yousafzai, Oslo, 10 December 2014. Malala challenges girls everywhere to try their hand at coding by participating in The Hour of Code.